Cut your own french fries at home, prepare cucumbers for pickling, or give carrots a fancy look for your next soup, stew or salad. This extra piece only works with our Stainless Steel V-Slicer, and once installed, it will transform that tool into a waffle slicer for added functionality. It inserts to cover the regular straight blade, and replace it with a wavy one. It still has the same v-shape, and it's still incredibly sharp and long lasting, so rock hard root vegetables will slice with ease, and minimal resistance. A regular motion will result in standard thickness slices with a wavy finish on the top and bottom. With an added technique, you can create holes in the middle to give each piece a waffle look. The slicer alone offers incredible functionality, but when you add this additional piece, it becomes even more useful. Switching it out only takes a matter of seconds, and it's totally dishwasher safe whenever it gets dirty. Any other food that is similar. Once installed, the lower, plastic portion will cover the regular blade. As you move up and down, only the wavy, v-shaped blade on this insert will come into contact with your food. It only allows for a single thickness option, but the standard size is what most people prefer anyway. Use with the safety holder to speed through a bag of potatoes, and cut every last bit. Surgical grade steel will slide through tough food without effort, so tough vegetables will slice quickly and easily. To use it, fold back the top handle and slide out the currently installed insert. Slip this waffle insert into position, and then fold the handle back up to lock it in place. Make sure that the insert is all the way into position, and the regular blade is covered by the lower portion. Always use with a safety food holder. Attach food and use for protection while slicing. To make regular wavy slices, simply slide back and forth across the blade. To make waffle slices, a rocking motion is required. Make your first slice straight down, then rotate 90 degrees. Slice again, then rotate back 90 degrees, and slice again. Continue with this rocking movement as you slice, and the pieces will have ridges and holes like a waffle. Remove by opening the handle, and sliding it back out. Top rack dishwasher safe when dirty. Dimensions 8.75" x 4" x .6"
Uses For giving vegetables a wavy or waffle finish. 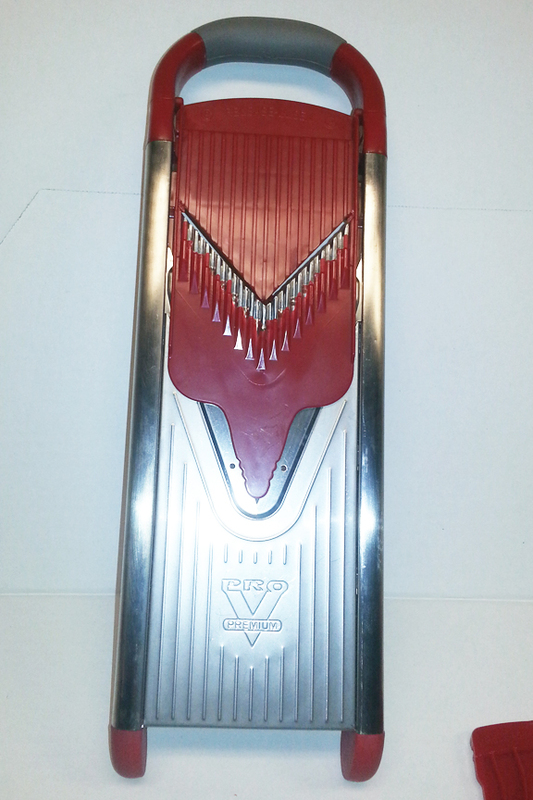 Compatibility Works with our Stainless Steel V-Slicer. Make your own french fries, or just improve the look of veggies that you add to soups, stews and salads. Order Yours Today! We added the Waffle Blade Insert to make wafffle fries but it slices potatoes real thin and we ended up getting the BEST chips we've ever eaten. Thinging of buying another and working on it to cut thicker but for now we are enjoying fresh natural chips. 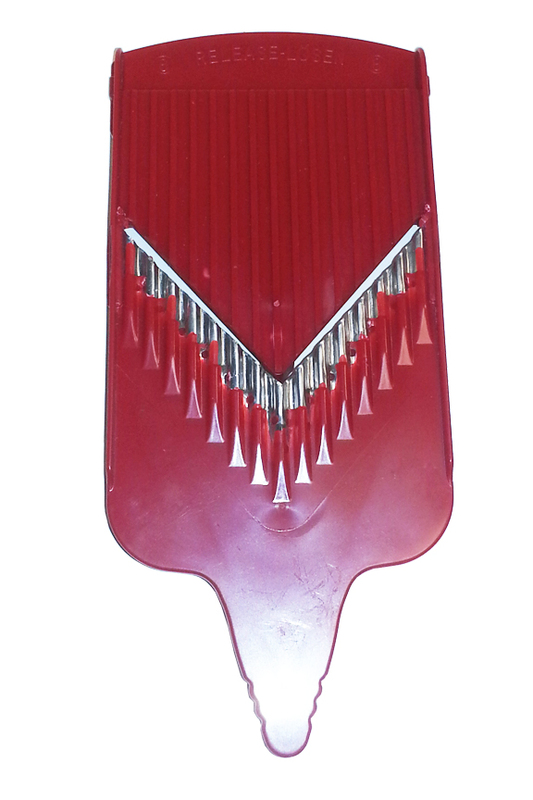 A Single Thickness Slicer With A Sharp And Precise Blade.